Experience a new way to search. triSearch is a legal search provider that offers national searching information for a range of professionals. 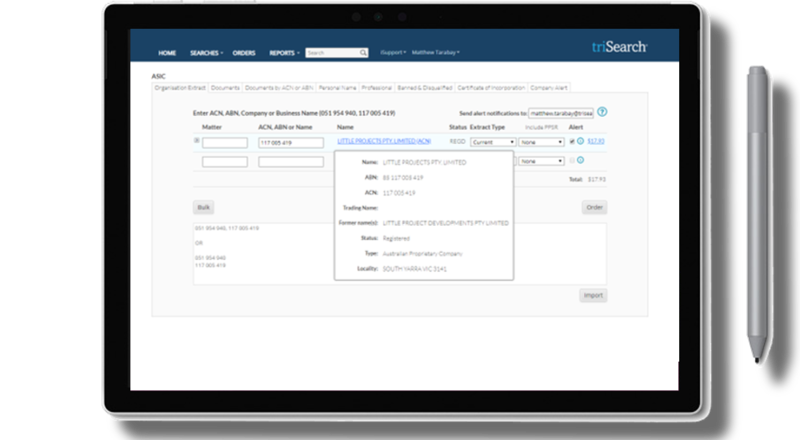 With triSearch, you get an all-in-one search experience with a seamless platform, competitive price and market-leading service. What do we mean by ‘a new way to search’? We have combined the three key elements that make for a seamless search experience. An intuitive platform for a smooth searching experience. We integrate into leading Practice Management Systems and eConveyancing platforms. We understand price is important and that’s why it’s the triSearch promise to match any prices you’re currently being offered by a competitor. Leave your details below and a member of our team will be in touch shortly. We offer a 10-minute call-back response time on enquiries through our platform and one-direct point of contact for any questions you may have. triSearch presents a comprehensive offering of searches across Australia, with over 4,500 different types. Whether your business specialises in Family, Litigation, Corporate, Property or other law, our platform can simplify your searching process. Be guided through a search with minimal clicks and data entry, putting time back into your day. As a search provider, we use the term ‘integration’ to refer to the connection of our search platform to the numerous online tools available in the legal profession, such as Practice Management Software and eConveyancing platforms. As the industry continues to adopt these tools, we will continue to improve our integration offering so that your business can remain streamlined and efficient. We pride ourselves on building long-lasting relationships. For this reason, we put customer service at the forefront of our offering. When you sign up with triSearch you will deal with one direct point of contact for all your training and support needs. You can also ‘request a callback’ from the platform and the right person from our help desk will contact you within 10 minutes. We’ll pick up the phone so you don’t have to. Our team can complete your electronic settlements. We have a team on-hand that can undertake electronic lodgements and settlements on your behalf. Find out more. We’ve got you covered end-to-end. To simplify the eConveyancing process, triSearch offers an end-to-end solution for your matters. From Verification of Identity, through to Property Certificates, Electronic Contracts/Signing and eSettlement, triSearch is with you for the entire journey. Want to know more about a search or service? Download our free information pack. Simply fill out the form to go in the running. The winner will drawn on Wednesday, 29 May 2019 and announced on our Social Media.